The recipe for my Chefs Flavours one shot. Sorry I've been a bit late releasing these! 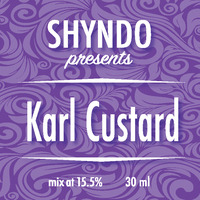 As per the link: https://chefsflavours.co.uk/karl-custard-30ml-shyndo/ this is pistachio with aromatic ruyan custard and a spicy vanilla brown sugar finish. Basically my own loveletter to the pistachio ry4 profile just done a little differently. Using such a large amount of tpa pistachio on top of brown sugar can be quite sharp. Usually you would use your typical ry4 to force mute this a bit but WF vanilla Ruyan Custard lacks the "ethyl maltol mixing everything together" quality. So we use heaps of vanilla swirl to calm down the sharp edges and fill out the volume a bit. The star to me is actually the WF vanilla ruyan custard in that it's the only ry4 I've had that has such a distinctive "layer" to it. It stands out on its own and in its own place in the vape where something like tpa ry4 double would just BE the whole vape in combination with whatever flavors you use. This recipe is the property of shyndo and released under the CC Attribution-Noncommercial 4.0 license. You may not copy, derive or commercialize this recipe without following the terms of this license or the explicit permission of the creator. This looks like a pistachio ry4?